Bio: Marcia Holmes was born and raised in Laurel, Mississippi, home of the Lauren Rogers Museum of Art. Marcia started painting and exhibiting in 1999 after a career as a corporate C.P.A. She attended Ole Miss (University of Mississippi) and USM (University of Southern Mississippi), acquiring a Masters in Accounting. In the arts, her teachers have been Albert Handell, Gil Dellinger, Doug Dawson, Maggie Price, Alan Flattman, Camille Przewodek, Sally Strand, Frank Federico and Jimmy Wright, among others. Marcia teaches workshops - she currently lives in Mandeville - and conducts travel/painting trips to France. 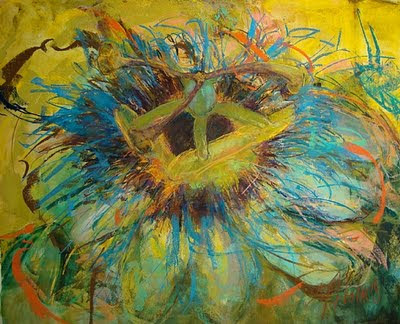 Marcia was featured in the October 2007 issue of The Pastel Journal, and her work has recently been featured in both the March and May 2011 issues of the American Art Collector Magazine. She was a member of the Degas Pastel Society group that exhibited in the Festival International du Pastel at Feytiat, Limoges in 2008. Navigation: A FineArtStudioOnline website. I don’t know to what extent this site may be customised, but the garish green, orange, pink, red and blue typefaces on the home page do not set up your eyes to view the paintings. Gallery: Paintings: Preview Current Exhibit-Rue du Pont Breaux Bridge ; Mallory Page Gallery - Jammin' on Julia; Studio - Mandeville, LA ; Landscapes ; Botanical ; French Countryside.Venice, Italy; People; Limited Edition Prints. Image View: The thumbnails enlarge in a pop-up when clicked and you can proceed forwards or backwards through the enlarged images. Download is not blocked. Images are labelled with information on medium and dimension. Passion Flower is 24 x 30 ins, 550 x 446, 305 KB.